The Sketchfab Exporter for Cinema 4D is an export and publishing plugin that uploads your 3D models directly to your Sketchfab.com account. Sketchfab* is a web service to publish, share and embed interactive 3D models online in real-time without plugin. The Sketchfab Exporter for Cinema 4D is an export and publishing plugin that uploads your 3D models directly to your Sketchfab.com account. 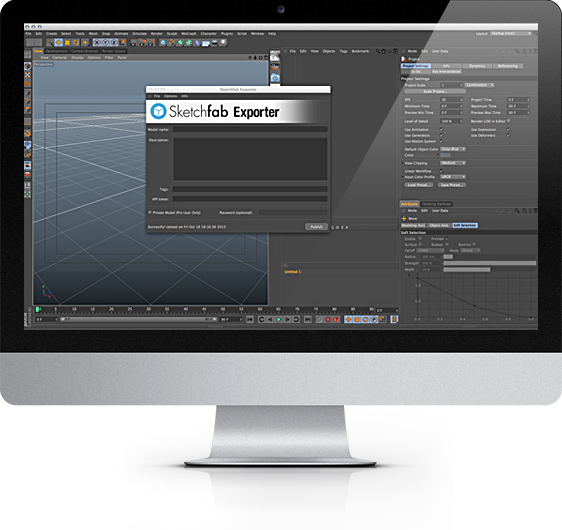 Available for Mac OSX & Cinema 4D R13, R14, R15 & for Windows R15. *Not affiliated or endorsed by Sketchfab.com.